The Reinvention of the "Wein-Bowle"
Most of my regular readers might already guessed it and I might have mentioned it already: I am not the usual German. But even I cannot dismiss everything from my roots. This is not always apparent, but sometimes it flashed up. And I don't mean the contemporary German bar culture. This is in full swing - just at this time, there is the BCB - the Bar Convent Berlin, a mixologists' fair, which doesn't only attract Germans anymore - it is an international event and bar personalities are travelling there from around Europe [and some even further]! My career started in Germany and when I left, the raise of the bar was in remarkable. But everything which is happening in the bar, has strong international [means American] influences and are just supported by some regional variations and regional products. The bar in San Francisco will be more different from the "modern American bar" than the bar, which you can find in Germany. Long story short, but there is very few things in German bar history, which can be revived, revamped and updated. However I was quite surprised, when I thought about my latest experiment. I had some quite ripe strawberries in the fridge [I am buying after my nose - even if the strawberries look gorgeous, but smell bland, I won't buy them. Well, unrelated, I do the same with cheese]. And I had a "normal" bottle of rosé wine. So what I did is, slicing the strawberries and macerating them in very fine bar sugar. And after that putting them into the Soda Plus - added the wine and charged it with nitro. After that filled it up with ice and put it in the fridge [yes - I run out of CO2 bulbs]. Today I took it out of the fridge and charged it with 2 CO2 cartridges. And - it tasted very nice. I just added a bit of my "sour syrup" [which is rich syrup with added citric acid] and a bit more sugar. Delicious. 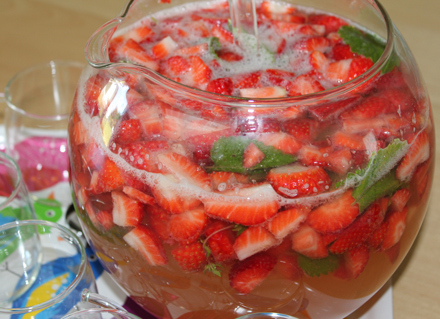 But then it stroke me: I just reinvented the German classic "Wein-Bowle" [which you could translate into wine-punch]. Usually wine is infused with fruits, sugar and sometimes herbs and then "stretched" with carbonated mineral water and/or sparkling wine. And while my recipe was much more contemporary and used modern techniques [and ended up to be much cleaner tasting], it wasn't so far off. This would be a perfect pre-bottled "cocktail". It would be definitely meet the demand for aromatized wine drinks - but would have only good ingredients and would taste - well, superior to anything which has a minimum of 12 month shelf-life. So - while it doesn't happen so often, it still happens: You can utilize a common, traditional drink, and update and reinvent it.